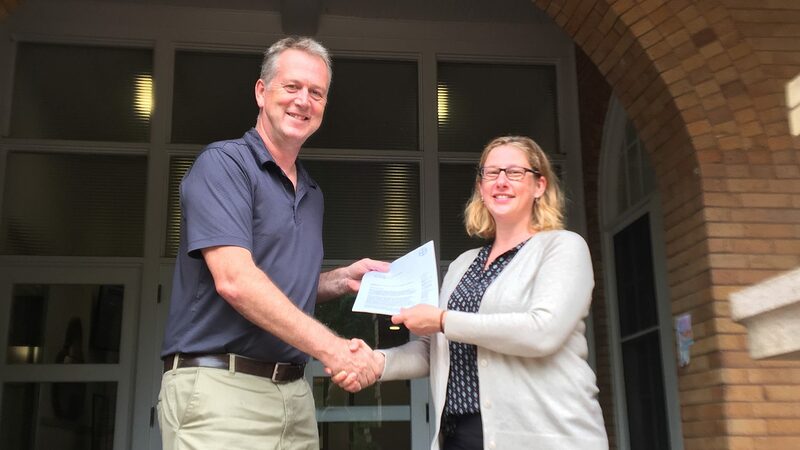 Adrian Percy, of Bayer Crop Science, hands a check to CALS' Danesha Seth Carley in support of a proposed regulatory science center for agriculture. The proposed center – part of the college’s Plant Sciences Initiative – would bring together efforts at NC State related to the complex world of regulations governing agriculture and the science behind them. Danesha Seth Carley, of the Department of Horticultural Science, is guiding the effort by reaching out to potential scientific partners at NC State, in industry and in government. Meanwhile, faculty members are developing an academic minor in regulatory sciences as well as writing grant proposals to agencies and other interested organizations. The effort began about two years ago, when Carley’s colleague Keith Edmisten, of NC State’s Department of Crop and Soil Sciences, organized a well-received course about the scientific and policymaking steps that shape state, national and international regulations for the agricultural industry. Beyond these academic goals, the center will also to work to find, and fill in, the gaps in related sciences, Carley said. It will conduct educational outreach efforts for stakeholders, including the public, the agriculture community, nongovernmental organizations and partners in industry and with federal agencies. The biosciences industry – those who develop and sell pesticides, biological products and agricultural biotechnology to farmers – have been supporters from the start. “Bayer recognizes the great need to properly train and educate on science-based regulation in order to ensure a safe and sustainable food supply for the future and is proud to help establish the Center of Excellence in Regulatory Science at NC State,” he added. Carley and others in the college see the center starting as a university consortium, involving both industry and government. While industry would have a seat on the proposed center’s advisory board, Carley stressed the center can’t and won’t be solely funded by the industry. We have a great team of people committed to moving ahead.